Lotus Blossom Tank KAL: Aloha! I started this great tank on June 11th, but just found the KAL today. I could have used the emotional support during my gauging and lace-knitting (first time with lace patterns) but am thankful I found y'all now! So I will be here, knitting, and holding my breath. I love seeing everyone's photos, and it is comforting knowing y'all are out there! ooh, I LOVE Zara merino! I made a DNA scarf for my DH and it's so cushy, soft and springy. I'm curious to see how it turns out. I've wondered if part of the reason most of us are finding our first attempts huge is that the bamboo is stiff. Whereas the merino will possibly pull in a bit and fit more closely. Who knows, I'm just speculating. Howzit! You're on the Big Island, right? I went back there a couple years (already!). It's always been my fav island to visit. 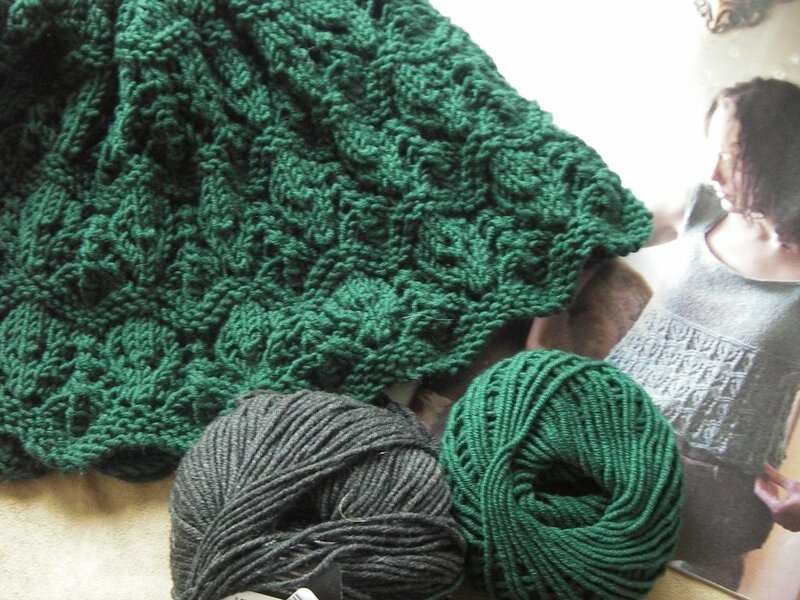 I'm afraid I have no suggestions on where to put the gray 'cept maybe after you finish all the full lace repeats, in the 4 rounds of the lace pattern thats the garter stitch look before going into the full on St st portion. Maybe someone else has more creative ideas. Ooh, very pretty, soft-looking yarn. I think it would look nice to incorporate the grey in the garter stitch between the lace and the stockinette sections. Don't know if that'll be enough to make the green stretch far enough, but if not, you can always see if someone out there in knittyland has a spare ball of the green to swap with you! Yep, Big Island. Unfortunately far from a LYS and not a great place to wear wool. I therefore try to furiously buy up all the summer knitting mags for light ideas like the LBT. I have put the grey in to the between-area garter stitches, even adding another garter row to stretch. Still wondering if the green will hold. I also wonder how the Merino will block out, and so far have not had the oversizing problems, since I messed with the needle size and gauge so often. Great idea - I use Zara alot, as it's just about the only wool I've ever found that doesn't make me itch like crazy! I'll definitely be keeping an eye on your progress!